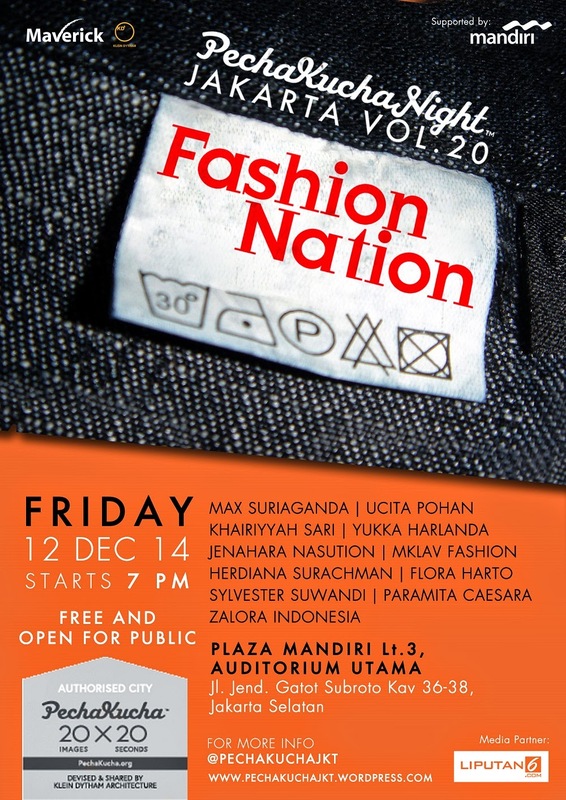 PECHA KUCHA JKT VOL.20 FASHION NATION - It's not secret anymore that I will be one of the speakers on Pecha Kucha Night Vol.20 Fashion Nation next Friday. Got notice in a short time, I wish I did good with the slides and I hope I can deliver my message through those slides I made last minutes. I made the slides all day or two, but the format of Pecha Kucha is 20 seconds each slide, so I just got 6 minutes 40 seconds in total, so ya I wish it's not too short. I heard about Pecha Kucha long time ago, probably before Jakarta because Pecha Kucha was originally started in Tokyo, read about Pecha Kucha and I think it's interesting, because we gather to share everything, for me, I will share about what I do with my blog, men's fashion, and experience with digital things, travel and my idea about global competition. I can't share the slide right now, but that first pic is my opener slide, please come and see us on 12 Dec 2014 at 07.00 PM at Plaza Mandiri lt.3 at Auditorium Utama. See you there!